he 2018 Everest Canadian Senior Men’s and Women’s Curling Championships begin Saturday at Stratford, Ont. 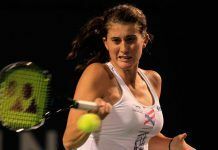 It’s the first time the city has hosted the Seniors but it staged the New Holland Canadian Juniors two years. Fourteen men’s and 14 women’s teams (representing the 10 provinces plus Northern Ontario, Northwest Territories, Nunavut and Yukon) will compete in the Stratford Rotary Complex, which houses both the RBC and Molson Arenas. The teams have been seeded into two pools per gender, based on last year’s results, and will first play a round robin within their pool through Monday. The top four in each pool then advance to the Championship Pool for games against teams from the other pool, while the remaining teams go to the Seeding Pool. At the conclusion of the Championship Pool on Wednesday, the semifinals will be held Thursday, March 29 at 10 a.m., pairing 1 vs 4 and 2 vs 3. The winners then advance to their respective gold medal finals at 2 p.m. while the losers meet in bronze medal games at the same time. All playoff games will be held in the RBC Arena. This year’s renewal brings together not only the reigning Canadian senior men’s and women’s champions but also former champions as well. Many of the participants also have Brier or Scotties Tournament of Hearts experience. 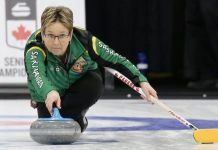 In women’s, Saskatchewan’s Sherry Anderson, a former Scotties and Trials silver medallist who won last year’s seniors title at Fredericton, has returned to defend her title. New Brunswick’s Heidi Hanlon, another veteran Scotties competitor who won the 2011 Canadian and 2012 world senior crowns, has qualified again, as has 2015 Canadian Seniors champion Terri Loblaw of Alberta. Also in the field is two-time (1995, 1998) Canadian Mixed champion Mary Mattatall of Nova Scotia. Skipping the host province will be Colleen Madonia of Thornhill, who won a bronze medal at the 2014 Seniors when playing second for Marilyn Bodogh. Rounding out the field are British Columbia’s Lynne Noble, Manitoba’s Kim Link, Newfoundland/Labrador’s Diane Roberts, Northern Ontario’s Peggy Taylor, Sharon Cormier of the Northwest Territories, Nunavut’s Geneva Chislett, Shirley Berry of Prince Edward Island, Quebec’s Odette Trudel and Yukon’s Sandra Mikkelsen. On the men’s side, Wade White of Alberta will try to successfully defend the title he won last year in Fredericton. But there will be some serious challengers, including Northern Ontario’s Al Hackner, the 1982 and 1985 Brier and world men’s champion, who is also a former Canadian Seniors winner (in 2006) and a world seniors silver medallist in 2007. In addition, he won last year’s Canadian Masters. Ontario’s Bryan Cochrane, the 2016 Canadian Seniors champ and a silver medallist in the 2017 World Seniors is back, as is Nova Scotia’s Alan O’Leary, who won the 2014 Canadian title and was also a silver medallist in the 2015 World Seniors. New Brunswick’s Terry Odishaw, winner of the 2007 Canadian Mixed, won a bronze medal at last year’s Canadian Seniors after going unbeaten until the semifinals. Completing the field are British Columbia’s Craig Lepine, Manitoba’s Dave Boehmer, Newfoundland/Labrador’s Mike Ryan, Glen Hudy of the Northwest Territories, Peter Mackey of Nunavut, Prince Edward Island’s Bill Hope, Quebec’s Ted Butler, Saskatchewan’s Darrell McKee and Yukon’s Pat Paslawski. The Canadian Senior Men’s Championship began in 1965 at Port Arthur, Ont. Since then, Manitoba has won a leading 12 titles, Ontario is next with 11 while Alberta has nine. The Canadian Senior Women’s Championship began in 1973 at Ottawa. Ontario has won a leading 10 crowns, followed by British Columbia with eight and Alberta and Saskatchewan with seven each. However, Ontario’s last victory was back in 2006 by four-time champion Anne Dunn. The championships were conducted separately until being combined in 1985 at Yorkton, Saskatchewan. Ontario has hosted four Canadian Seniors since then, the latest in 2010 at Ottawa. Prior to amalgamation, the province staged four men’s and two women’s championship events. This year’s winners will represent Canada in the 2019 World Seniors, at a site and date to be announced by the World Curling Federation. The World Seniors officially began in 2002. Canada has won a leading nine men’s and 11 women’s titles. Since 2005, the winners of the Canadian Seniors have represented Canada in the following year’s World Seniors. Thus, last year’s winners – Alberta’s Wade White and Saskatchewan’s Sherry Anderson – will wear the maple leaf in the 2018 World Seniors, April 21-28 at Östersund, Sweden.